The Muni metro station ticketing machines are not too user friendly, especially when they raised the minimum reloading amount for existing Clipper cards from $2 to $5. While you have to punch a bunch of buttons to get what you need, at least it the machines have the capability to purchase new cards, load various amount of e-cash, and purchase any available passes or ridebooks available. Last Sunday, I had a bunch of pocket change I wanted to convert into Clipper e-cash, and the experience wasn't as pleasant as I expected. I spent a few minutes at home sorting through all the change and had ten dollars in quarters, just enough to load $10 of Clipper e-cash to my card. I went to the Powell Street station's Muni ticketing machine with my roll of quarters in hand and told the machine I wanted to load $10 of Clipper e-cash to my existing card. The machine told me to start feeding money into the machine and I started dropping my quarters in there. When I inserted $7.50 in quarters into the machine, it told me to stop feeding coins as I inserted the maximum amount (30 coins), and I was forced to insert a few dollar bills to reach the $10 I told the machine earlier I wanted to insert. In all fairness, I wish the machine would have told me there was a 30 coin maximum limit. It was Sunday and the bank was closed to exchange my $10 of quarters into bills. The metro ticketing machines doesn't have much flexibility when you want to add Clipper e-cash to your account; before you even insert money into the machine, you have to tell the machine what exact amount you intend to purchase (starting at $5). The choices on the screen are very limited and start off in five dollar increments. BART's new Clipper purchasing capabilities on their ticketing machines are so much easier. When you buy regular BART tickets, you can adjust the amount you inserted into the machine to get it to the exact value you need (e.g. round trips without residual value left), and since many of the machines now allow Clipper e-cash purchasing, you get that same benefit to adjust how much you want to add to your card. Still, the weakness of BART's ticketing machines with Clipper purchasing is it will only do e-cash purchases only. Even an in-person vendor can offer you the flexibility because you can tell the vendor what specific amount you want to add and get change for your purchase. 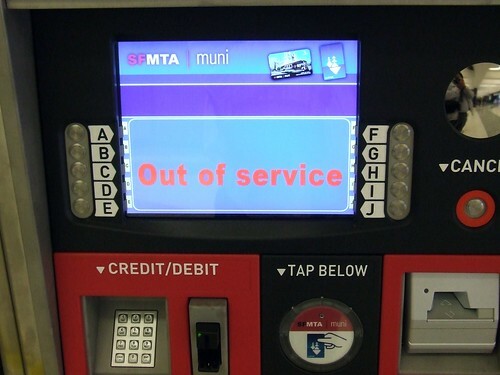 Video footage of a Muni ticketing machine doing a purchase. Video footage of BART ticketing machine doing the same purchase. I think Muni should change the way their ticketing machines operate. Why should a passenger be punching a bunch of buttons just to initiate a loading of Clipper e-cash on their existing card and only have a limited choice of what to purchase? Lastly, why raise the minimum reloading from $2 to $5 when BART's can do it for just five cents (yes, I said it, five cents). Perhaps they wanted to limit the amount of time for people waiting in line for the machines. Or is it the manufacturer's fault, I'm not sure. Well, I only saw lines during first few days of the month, when their commuter benefits arrive. It's the same thing when the Montgomery "paper pass" booth was there. There's a bill limit too! Fifteen bills only! I wanted to buy a pass with a variety of bills, once it reached $65, I was told to put in coins only. I cancelled the transaction, and all bills returned. I went to the BART machines to change a couple one dollar bills into coins. There was a set of 3 Muni machines, so I didn't use the exact same one again. Okay, I purchased the pass again. First I put in a $10 bill, then I put in 2 quarters... The machine told me that it could no longer accept coins. I cancelled the transaction, again. It gave me back $10, and a receipt, saying that it won't be able to give me back the 50 cents I just put in! The receipt told me to call Clipper! I was forced to start over again, this time, on the original machine when I started at the beginning. A combination of bills and coins, it worked. So I called Clipper right away when I got home, she told me to call again on the next day. Data was not available yet. The agent even asked me why would I put in coins to purchase a pass! Are you expecting me to use LARGE BILLS ONLY? That incident was in late-January, when I was purchasing a February pass. I already called the next day, and I told them to put that 50 cents into e-cash. When it was about the end of February, purchasing a March pass, it still never came up! I filled out the "Contact Us" form online and told them about that 50 cents. One week later, I finally got the refund. Are you expecting me to deposit my handful of bills and coins into the bank, then use a credit card to buy a pass? I just wanted to skip a step. Next time, may be I should use a credit card instead.